Modern electrical systems can be incredibly complicated, but the science behind the infrared thermography of electrical systems is actually quite simple. Electrical systems are designed to be efficient. This means that they general give off as little heat as possible given the requirements of the system. Too much heat causes problems. These can be subtle problems, like the slow degradation of the electrical system, or big problems, like fires! 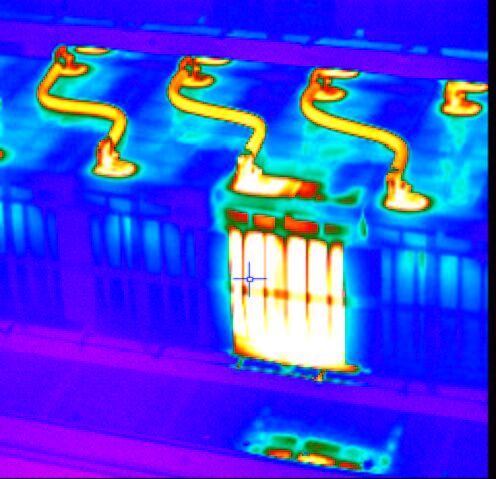 When an electrical component is not operating at its most efficient, it gives of an excess amount of heat and our infrared cameras can detect these heat signatures. If the components are allowed to run inefficiently for too long, they can put strain on the other components which can decrease the life of the whole system. Frequent inspections can offer great savings when compared to the cost of prematurely having to replace parts of your electrical system. Where electrical panels and other electrical components are concerned, it can be impossible to detect problems visually, so if your electrical system is aging and you want to catch issues before they become major problems, it’s a good idea to schedule an inspection!